In this video lecture, Dr. Ian Dunbar addresses one of the most worrying behavior problems any dog owner can face - dogs that bite. Dealing effectively with canine aggression necessitates a comprehensive understand of its underlying causes. 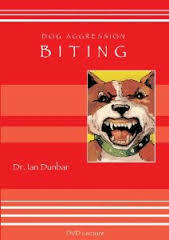 In his characteristically entertaining and enlightening style, Dr. Dunbar offers a thoughtful analysis of why dogs bite, outlining a variety of common-sense preventative measures and practical remedial training techniques. Topics include: The relative influence of nature (genetics) and nuture (learning) on the development of canine aggression. An in-depth review of the many situations that may provoke a dog to bite. How to recognize warning signs and how to defuse potential triggers. A comprehensive classification of dog bites on the basis of severity and owner's responsibility. A detailed program of simple and effective behavior modification and temperament training techniques to prevent dog bites.